Spring has caught me by surprise yet again and, more specifically, has shed some light on a few gaping holes in my daughters’ warm-weather wardrobes. But armed with our Gathered Skirt pattern and our gorgeous new Mineral Linen, I am prepared to fill in the gaps! 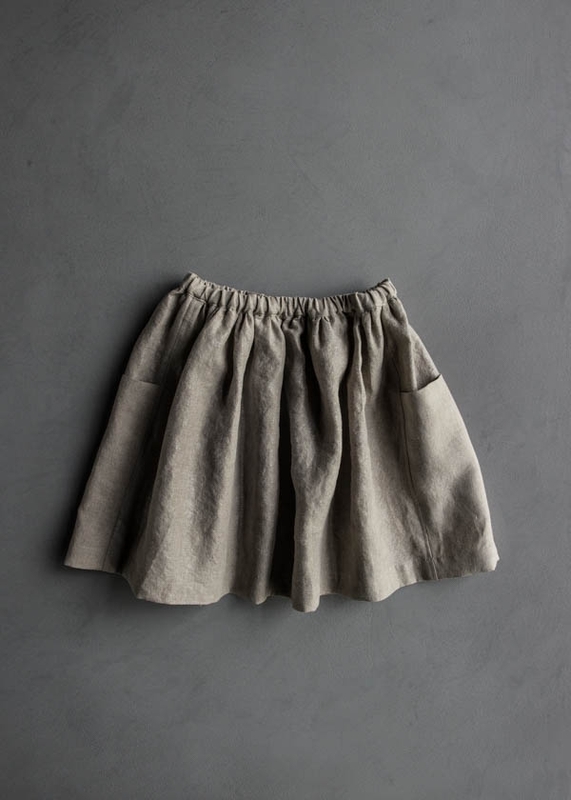 Our Gathered Skirt for All Ages is the perfect pattern for Purl Soho’s beautiful Mineral Linen. The subtle sheen of this unique fabric reflects light and shadow in the soft gathers of the skirt, and for the large side pockets, we’ve reversed the fabric, showcasing its natural, matte side. 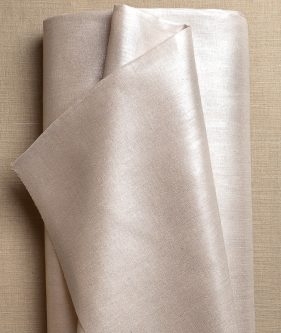 1 (1 ½, 1 ½, 1 ¾, 2, 2) yards of Purl Soho’s Mineral Linen. We used Pink Opal (shown above left) and Mica (shown above right). One 110-yard spool of Gutermann’s Cotton Sewing Thread in a color to coordinate with the fabric. We used color 9045 with Pink Opal and color 3170 with Mica. 2 ¼ (2 ¼, 2 ¾, 3 ¼, 3 ¼) yards of Purl Soho’s Mineral Linen. We used Sterling. Two 110-yard spools of Gutermann’s Cotton Sewing Thread in a color to coordinate with the fabric. We used color 9280. For the free pattern, including step-by step photos, a video tutorial, and lots of tips, visit our original Gathered Skirt for All Ages story. Follow the instructions for the Contrast Pocket using the matte side of the Mineral Linen fabric as the right side of the Pocket piece. Thank you for this beautiful free pattern. I love everything you guys do, so modern, simple, stylish, with beautiful materials – celebrating age old skills such as knitting, needlepoint and sewing! Also, I don’t know whose daughter the model is, but she is just lovely, I enjoy watching her “grow up” and model so many of your lovely work. I will make this skirt for my daughter. This is a beautiful pattern. Thank you for making it free and available. Love you, Purl Soho! I love the original Gathered Skirt. It looks even more gorgeous in the mineral linen! Can’t wait to make this. Thank you so much for your kind words! 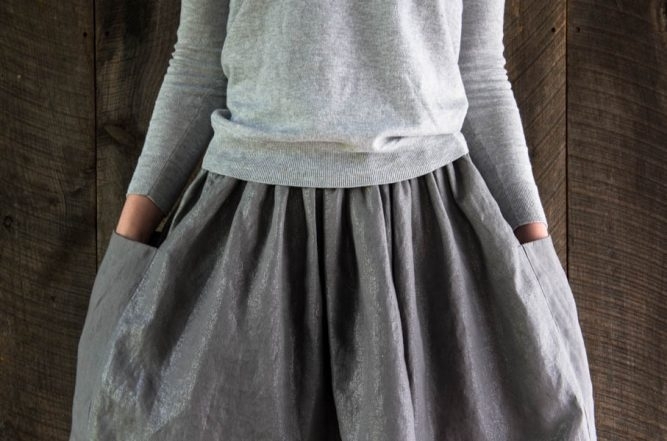 The Mineral Linen makes for a stunning Gathered Skirt! Thank you for writing in! This is a lovely post. Thanks for the pattern, which I just downloaded. You all have really great taste in design, form and function. 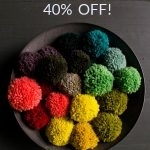 BTW, I can’t wait to open the Purl Soho box of goodies we ordered for me for Mother’s Day! I love the pattern. Thank you. Hello! This is gorgeous. One question- if I am one size in the waist measurement and one size larger in the hip measurement, which size should I make? I often end up with a gap in the back of my jeans at the waist for this reason. #booty. Thank you! 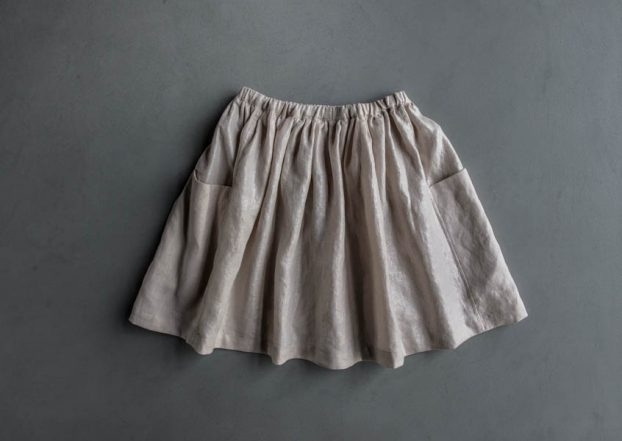 I recommend making the skirt to fit your hip measurement and cutting a custom-fit elastic band, as described in the Cut section of the pattern to fit your smaller waist. 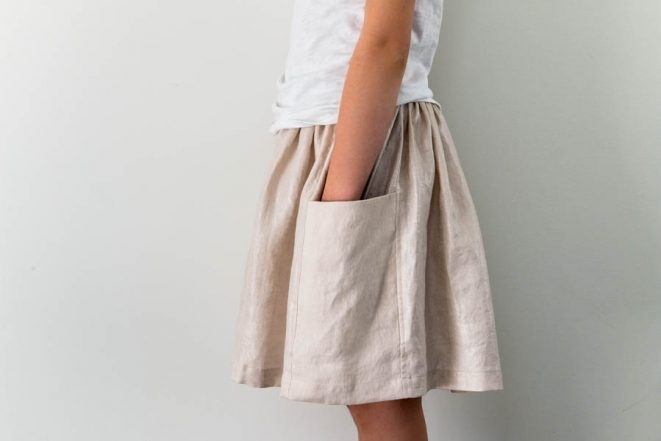 This will ensure that your skirt is roomy enough in the body, but still fits nice and snug around your waist. 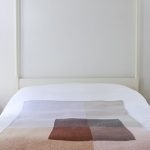 Can’t wait to receive my mineral linen! Hi. This fabric is wide so I would only need 2 yards for the 2nd smallest size? Thanks! This is a great question. 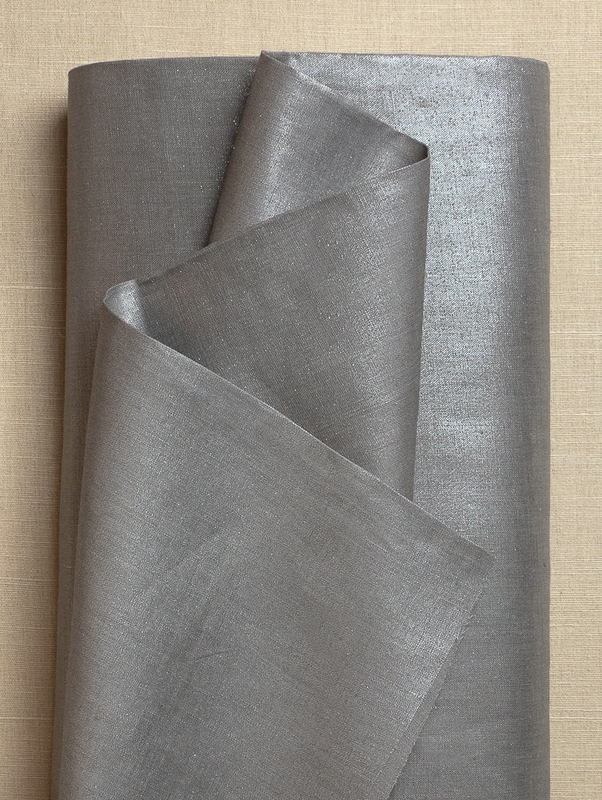 The yardage we offer in this post is for 54-inch fabric. It is possible that you could cut your pieces from a smaller cut of fabric, however we err on the larger side for our yardage to accommodate for shrinkage and slight miss-cuts. Hi! I absolutely love this pattern and want to give it a try as soon as I can. 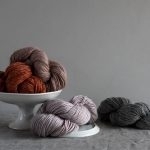 I was wondering if the mineral linen’s texture is about the same than the texture of the linen grid? 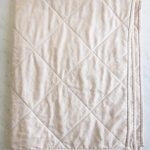 I’m considering using the linen grid or would you rather recommend a thinner fabric? Thanks for writing in! 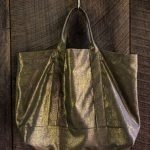 The Mineral Linen is a bit tighter weave that the Linen Grid but the metallic overlay gives the fabric a bit more body. We have made skirts of both the Mineral Linen and the Linen Grid and both make a lovely and wearable final garment. I say go with what you want and you should have a lovely skirt! I want to make this skirt in a one way design. Can that be done and can you give me any tips to make the pocket work out correctly? Thanks for writing in! I don’t know if I understand what a one way design is. Could you please further explain? I’d be glad to help and I’m sure I have some tips. Hi Adam. Material that has a top and bottom design like a lion where the head needs to be up and the feet down. Like corduroy with a nap. All panels need to run the same way. Thanks. I see now! Thanks for clarifying! Unfortunately a placement print requires that you buy extra fabric in order to work out the spacing of the print. Also, it depends on how much of the fabric the print takes up. If it’s a small print then you will be able to work this pattern out without buying too much extra yardage. However, if the lion is quite large and you want it on the front, back and pockets, you will have to buy however much works for the pattern. I suggest taking your pattern to the fabric store and laying it on the bolt to see how much you’ll need. 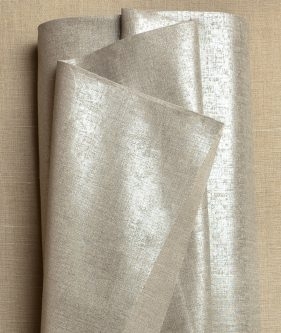 Could I use the handkerchief linen or watercolor linen or a lighter linen than the mineral linen? Thanks. Thanks for writing in! You absolutely can use the handkerchief or watercolor linen. 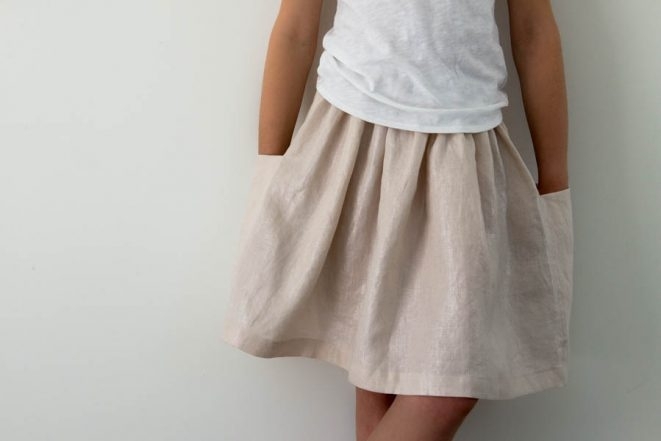 Originally, we used a much lighter fabric to make this lovely skirt and they came our beautifully! This skirt looks so beautiful, but I cannot find were to click for the printable pattern templates. When I click on “gathered skirt pattern” it just brings me back to this tutorial page. Thanks for any help! Thanks for reaching out! Here is a link to the pattern To determine the measurements to cut out for your skirt, you use the chart at the beginning of the pattern. Good luck with your project! Hello and thanks for the pattern! Absolutely love the look. Thanks for writing in! Adjusting sewing patterns can be quite a challenge! 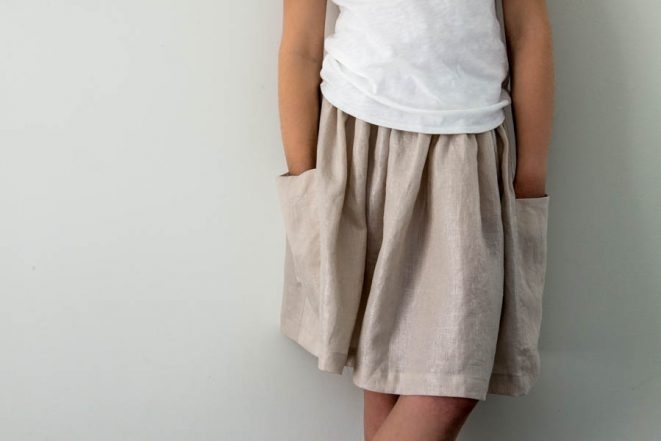 Here, the flow of this skirt comes from the fullness of the skirt. By reducing the fullness, you will probably see a a flatter look that does not move in the same fashion. I do not believe that altering the hem will increase the flow here. Perhaps a different pattern would better give you the look you are looking for. Our Pleated Skirt has a slimmer look while having a fair amount of fullness and flow that occurs due to the pleating. I hope that this helps and let us know how things turn out! Thank you for this great pattern! I’ve made this skirt for all 3 of my granddaughters. The skirts are great for school, play or dressing up. I’m unable to figure out how to download free patterns on your site. I can find the patterns you need to pay for but not the free ones. I would appreciate any help you could offer. Thanks for writing in! This is not a traditional paper pattern and as such there is no pdf or paper pattern to print out. 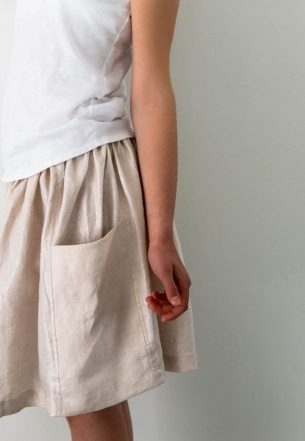 The cutting instructions are included in the top of the pattern (https://www.purlsoho.com/create/2015/04/27/gathered-skirt-for-all-ages/) . You will chalk in the pattern based on the measurements and the cutting layout. Let me know if you have any other questions — I’d be glad to help! 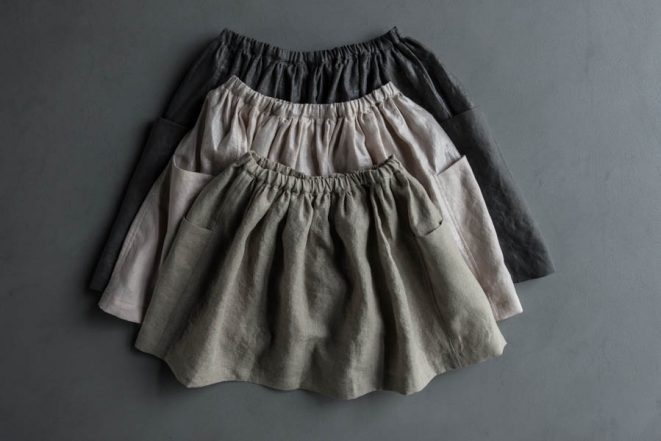 I am not adverse to elastic, however…love drawstrings, so I would make the waistband a bit wider to accompany the drawstring cord; does Purlsoho have white drawstrings by the yard? Thanks for writing in! I’m not sure if we have exactly what you are looking for but here is where you can find cording and ribbon; .